Recently we mentioned the 100-megawatt concentrated solar power plant going up in Abu Dhabi, which was on track to being the largest CSP plant in the world. This shouldn’t come as a surprise, but two companies are joining forces to work on an even bigger project, a CSP plant that will produce 500 megawatts of power in California. Led by Brightsource and Abengoa, the Palen project will be made up of two 250-megawatt units. At 750 feet each, they will be the tallest solar towers in the world. Construction will start at the end of the year, once permits are in place and development details are finalized. The plan is to have the plant online by 2016. The towers will produce enough electricity for about 200,000 homes, and cut CO2 emissions by 17 million tons over its lifetime. 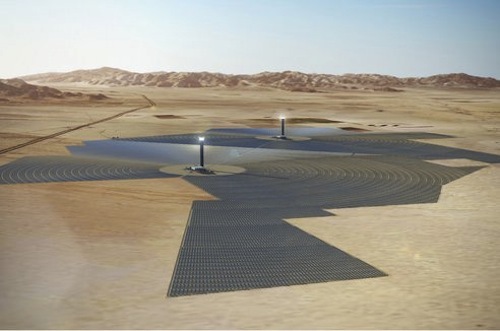 Half a gigawatt of concentrated solar power. Pretty exciting, especially when it’s highly likely that another project will come along that’s even bigger. Keep the competition coming.